Protect what you love with CFMoto's protection bar giveaway! Free protector bars, available now! From now until 30 June 2016, CFMoto customers who purchase a brand new U550LE for $13,490 or U8LE with power steering for $15,490 will receive FREE front protector bars valued at $749. 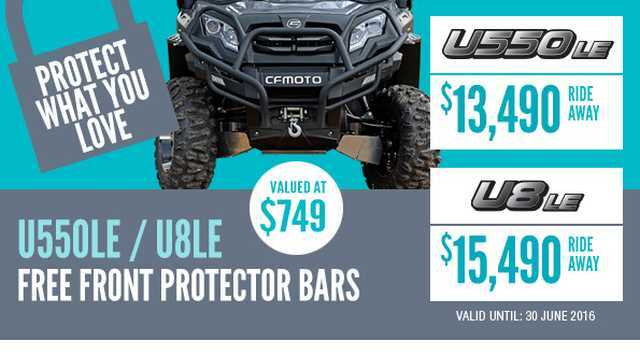 Adding to the $3,000 of standard accessories such as electronic power steering, roof, windscreen, tow pack, winch and 14” alloys, CFMoto’s ‘protect what you love’ promotion sees customers add even more value with genuine solid front protector bars. “We’ve stayed true to our value for money promise and believe our side-by-side utility range is a game changer in the Australian UTV market,” said CFMoto Australia’s, Michael Poynton. The Australian side by side vehicle market was the fastest growing segment in off road vehicle sales in 2015, something the global powersports manufacturer capitalised on with its value for money range. “We predicted the growth of this market segment a couple of years ago and have aggressively pursued a model range we knew would appeal to Aussie farmer.” Poynton said. Features like power steering for precise handling, Canadian CVT transmission for a smoother ride and a roof to provide protection from the unpredictable Aussie weather see UTVs a favourite with many. “We’ve also launched CFMoto Finance in the past 18 months to cater to a business market and provide our customers with a complete one-stop-shop when purchasing one of our vehicles” Poynton said.